The Days of Johann, an agility dog! 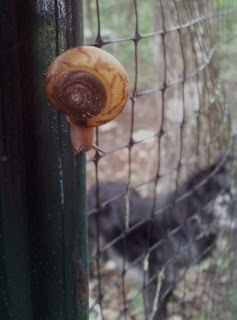 : So much rain, even the snails don't want to be on the ground! So much rain, even the snails don't want to be on the ground! Wow, we've had a lot of rain. We counted and up until about a week ago, it rained every day for just under four weeks straight. And three of those days in a row, it rained all day! Sometimes 2-3 inches of rain a day, filling up our doggie pool and making Mum bail it instead of just dumping it over. Thankfully, the rain is starting to ease up and we've had a day or so here and there without rain. The rain brought out the ticks, so Mum had to wait till there was a break last week to put down the diatomaceous earth, which we were able to have down for about 30 hours before the rain came again. But it seemed to take care of those nasties. We haven't seen a tick since. 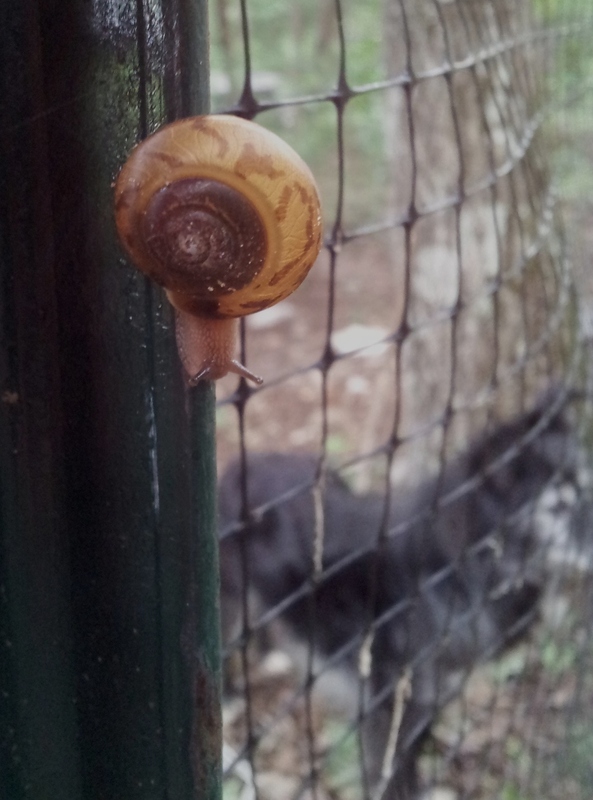 During the rains, even the snails didn't want to be near the ground, we found them everywhere....on the fence posts, on the front door, on the back deck, on the walls of the outside of the cabin, on the trees...always about four or five feet up from the ground. Smart snails. Mum took a trip into town to get groceries on Sunday, and she was driving down our mountain road (the only road to get into town) and saw all this mud on the road. What?!? 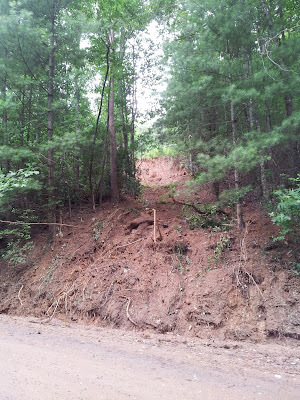 Then she looked up the mountain to the right and wow, a mud slide!!! 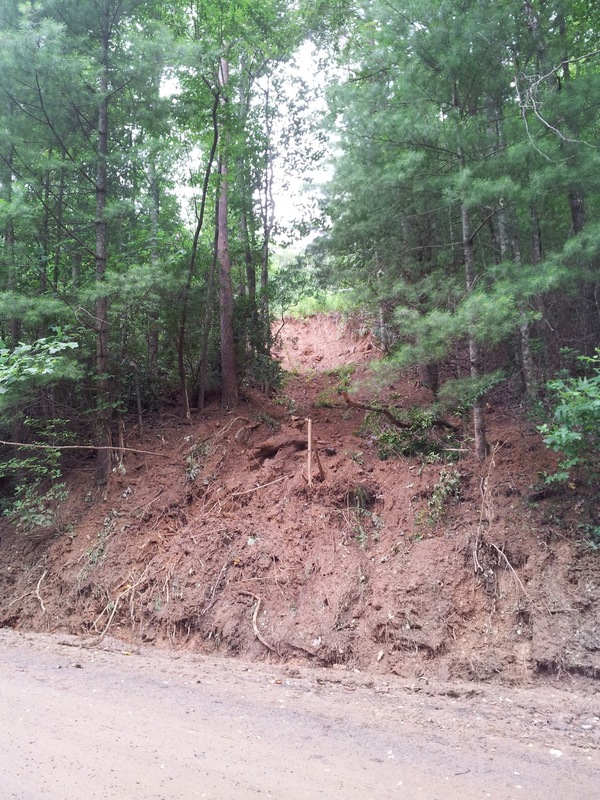 Seems it had happened a few days earlier and the county bulldozer had to clean up over two feet deep mud on the road, along with trees, logs, and other debris. Wow! While Mum was in town, she saw a local newspaper. We couldn't believe what it said. Seems we've had over 55 inches of rain here this year so far....that's just under a few inches of all the rain that we had all of last year! We thought we've had a lot of rain, but wow, that is a lot! Oh and guess what, as I type this, it started raining again, huh!!! Enough already!